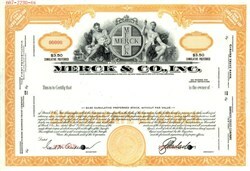 Beautiful RARE specimen certificate from the Merck and Company, Inc.. This historic document was printed by the American Bank Note Company and has an ornate border around it with a vignette of allegorical figures and the company logo. This item has the printed signatures of the Company's President, and Secretary. Merck & Co., Inc. is a global research-driven pharmaceutical products and services company. Merck discovers, develops, manufactures and markets a broad range of innovative products to improve human and animal health, directly and through its joint ventures.